TEL AVIV (JTA) — Had the shrapnel fallen a foot to the right, gas station attendant Michael Savlov would have been destroyed along with the rest of the Dor Alon gas station in southern Tel Aviv. Savlov was with a customer in the station’s office Thursday morning when a rocket from Gaza was intercepted overhead by Israel’s Iron Dome missile defense system. The rocket exploded in the air, but shrapnel fell onto the gas station, only narrowly missing the gas tanks. Long insulated from Gaza’s rockets due to distance, Tel Aviv has found itself a target in the conflict between Israel and Hamas that escalated Tuesday into a full-blown IDF campaign, dubbed Operation Protective Edge. Hamas missiles first reached Tel Aviv during the group’s 2012 conflict with Israel, but a larger stockpile of long-range missiles this time around has allowed it and Islamic Jihad, another terrorist group, to shoot many more missiles at Tel Aviv during this confrontation — at least 10 so far. The warning sirens that precede missile attacks, a seminal sign of the conflict in the south, have become a daily experience in Israel’s largest metropolitan area. The barrage has gone some way toward popping the so-called bubble that separates Tel Aviv from the rest of Israel, sending residents into shelters and stairwells for protection when warning sirens ring out. Israel’s Iron Dome missile defense system so far has prevented any deaths from the rocket fire, enabling residents largely to go on with their lives despite the threat of attack. All the same, Lugasi cautioned, “some people trust Iron Dome too much.” While residents have traded stories of waking up to a siren and rushing to the stairwell in pajamas, some Tel Avivis haven’t let the bomb threats interrupt their daily routines. At the city’s open-air Carmel Market, a crowded, chaotic avenue, customers bustled Friday amid the produce stands and cheese merchants. Fruit sellers yelling prices over each other in the unending quest to draw customers quieted down only when late-morning bomb sirens — distant at first — began to grow louder, closer. As the announcer mentioned other neighboring cities, alerts from afar, blaring faintly, could be heard. “Where are the missiles?” a young man asked. “Wait for the boom,” a cashier said. But after a moment’s pause, people kept shopping and pushing their way through the market. Explosions could be heard a few seconds later, multiple booms signaling a successful Israeli interception, but by then it was almost an afterthought. “They shoot the missiles, and Iron Dome intercepts it,” said Moshe Dali-Levi, a produce seller, smiling and shrugging. Another loud noise drowned him out from behind: “Five shekels for a kilogram!” one seller yelled. “Bourekas! Bourekas!” screamed another. At a nearby barbershop, Roni, 48, scoffed at the idea of hiding during a siren. Many older buildings don’t have bomb shelters, forcing Tel Avivis to improvise on a moment’s notice. At a nearby clothing store belonging to the popular Castro chain, employee Ayala Onunu, 20, said people are more cautious in her home city of Rishon Le-Zion, which also has had sirens. 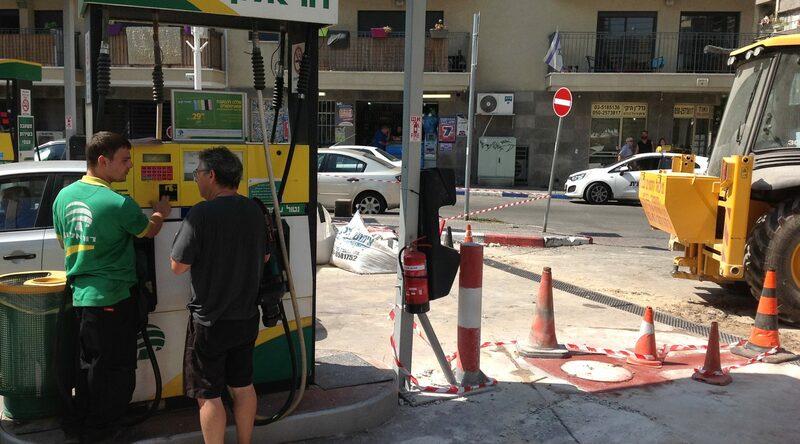 The southern Tel Aviv gas station hit by shrapnel resumed operations Thursday shortly after police and army personnel came to clean up the scene. Two hours later, Savlov was helping a customer fill up his car next to the police tape demarcating where the shrapnel landed. Savlov said he wasn’t scared, and that his life would continue on as normal. But he did learn one lesson from the ordeal, he noted.